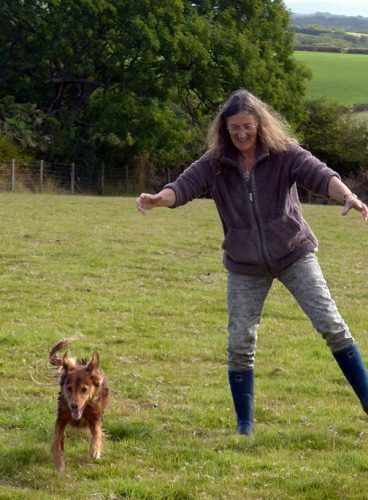 Rebecca Bryn lives near St Davids in West Wales with her husband and rescue dog. She is a multi-genre author but her first love is historical thrillers with a twist: tales of courage, hope, and unbreakable love. A self-taught artist, she also paints the stunning Pembrokeshire coast in watercolor and has work in private collections worldwide. She has contributed to three charity anthologies and is presently writing the third book in her historical series, ‘For Their Country’s Good’ a story inspired by family members transported to Van Diemen’s Land in 1841. She hopes to publish all three in 2017. I live with my husband and rescue dog in West Wales, where I paint the fabulous coastal scenery and write thrillers with a twist and a dash of romance. 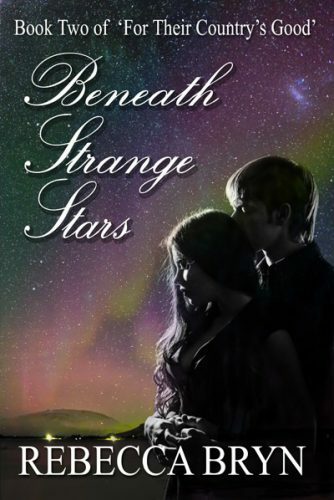 I have just published ‘Beneath Strange Stars’, Book Two of ‘For Their Country’s Good’ a series inspired by my great-great-great-uncle who, along with two of his cousins, was transported to Van Diemen’s Land for killing one of Lord Northampton’s gamekeepers. Ella, tell me a little about yourself. Where are you from? I was born in Bath, England, in 1823, the illegitimate daughter of a housekeeper. According to my mother, I’ve always had ‘ideas above your station life, young lady.’. I helped my mother keep house for Josiah Barton, solicitor, as soon as I could stand on a stool at the scullery sink, but I’d seen the hours she scrubbed and cooked, and the very different way young Ralph Barton lived, and wanted better for myself and my children. Ambition, not a virtue in a woman, has caused me a whole heap of trouble. What makes you Jem so special? It’s hard to say. I was promised to Harry, a good match for one of my station, but Jem, one of the bad boys in the village, excited me. It was the twinkle in his eye, his teasing… his love of nature, and the fact that he treated me like a person, an equal, and not a chattel. Tell me about your reputation and how it has impact your life and your relationships? I’d hoped, leaving Bath for Yardley Hastings, I could begin again with a clean slate. It was not to be. Ralph kissed me, and Josiah wanted me out of the way of his son’s temptation. I didn’t see the letter he wrote to Reverend Buchanan, but it must have been damning for the rector to brand me a whore. ‘The devil looks out of your eyes, Ella Maundrell.’ Hence his hurry to get me married off and safely someone else’s responsibility. That damned kiss caused everything that happened to me afterwards. It isn’t fair that it was me who was sent away. It was Ralph who kissed me! A tale of a young poacher transported to Van Diemen’s Land in 1841, and the girl determined not to be left behind whatever the cost. Do you have any regrets, Ella? Is there anything you wished you had done differently? Oh, Dear God, what a question to ask me. Have you read my story? Every choice I’ve ever made has gone wrong. I pleaded guilty to something I didn’t do and began a chain of events that led from disaster to disaster for everyone I love. In my home in Brown’s River Road, near Hobart. Hopefully with grandchildren and the man I love. Either that or the cemetery. I’ve had a hard life, borne a lot of children. Men and women don’t usually live much beyond their forties, and children often don’t survive their first year. At one time, I’d have said marrying Harry, and, looking back, it would have avoided a lot of my later disasters, deprivations and difficult choices. But then I’d never had had Matthew, my second son, or met Tom, and Jack, and Will. I have ten wonderful children from three different fathers, and I wouldn’t change having them for the world. I’d take Jem to England to see his mother, brothers, and sisters. He’s exiled to Van Diemen’s Land for life, so he can never go home to England. I began about thirteen years ago. I was proof-reading for a friend, and my husband said, ‘Why don’t you have a go?’ I said ‘I don’t have any imagination, and I wouldn’t know where to start.’ I think he regrets saying that now. I typed Chapter One, then ‘Jem frowned and scanned the horizon. Nothing.’ And I was off. Jem no longer exists in that novel, and no-one scans any horizons, but a story was born. It was published in 2015, after many drafts, rewrites, and even more years, under the title of Where Hope Dares. I like to get inside my characters’ heads and stay there. I also like a bit of descriptive prose, and emotional angst. I make my characters suffer! How did you come up with the title for your historical series, ‘For Their County’s Good’? It’s from the Barrington Prologue, written for a play about the transportation of convicts to Van Diemens’ Land . I didn’t intend there to be a message in it, but the more research I did, the more the subject of women’s rights, or rather the lack of them in Victorian England, became an integral and inescapable part of Ella’s story. I think we must be grateful we live in more enlightened times, but stay alert to erosions to the equality of women, especially as other cultures and many religions have different attitudes. Women died so we could vote, remember. An awful lot. I was fortunate to be able to access transcripts of committal proceedings and newspaper reports of Jem’s trial, the convict records of Jem and his cousins while aboard Stirling Castle, a prison hulk, on board the convict ship, HMS Tortoise, and at Impression Bay convict station. I also have the surgeon’s log and first mate’s reports of the voyage of Garland Grove, the ship Ella sailed on. All the ships mentioned sailed on the dates stated, to the destinations mentioned, and with the factual crews and cargo. Also Jem’s marriage permissions, marriage certificates, birth records of his children and his burial records. There is also a lot of information about the various convict station in Van Diemen’s Land, and life in them. The research was fascinating. My black sheep forebear was James Underwood, known locally as Jem. Jem was a real person, though obviously he died long before I was born: Grandma was very tight-lipped about him… Ella is fictional, but I have used a lot of my own life experience to underpin her emotions and character. I have faced some of her choices. I strongly refute any suggestion that I was ever a prostitute, however! There is a wealth of talent amongst Indie authors, but Lesley Hayes and Nico Laeser are two that spring immediately to mind. 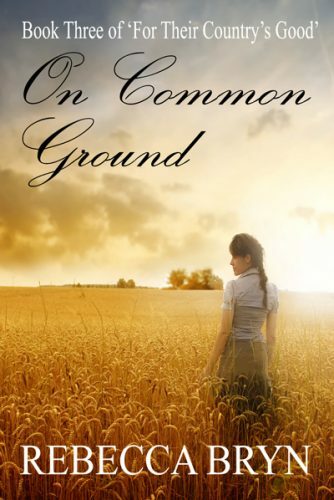 On Common Ground – Book Three of ‘For Their Country’s Good’ was recently released. Can I cheat and list three? The Word Cloud, an on-line forum for writers, Indie Author Support and Discussion, an invaluable Facebook resource and support group for authors, and Sarah Stuart, author of the Royal Command series, for her critiques, friendship, and support. I’d love to. This is the beginning of Book Three, On Common Ground. Ella has pleaded guilty to theft and has been transported to Van Diemen’s Land. She had hopes of finding Jem but has been forced to put herself forward for marriage to save their son from starvation. 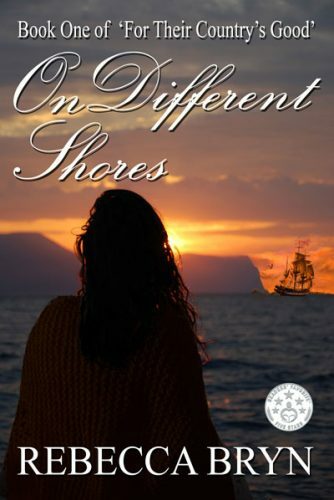 Her new husband, Tom, has succumbed to gold fever, and is taking her and her son to Australia, while Jem is still imprisoned in a penal colony in Van Diemen’s Land. The Blue Mountains, New South Wales: May 1843. From Katoomba, the trail had turned north into wilder terrain. Ella dragged the reluctant Blue along by her halter rope, the mare as loathe as she to climb higher into the mountains. They trudged on together, ever farther from Jem, the man she’d hoped to find in Van Diemen’s Land: the man she loved and who was William’s father. William was not yet two year’s old, but his little legs pounded along gamely beside her, his hands clutching a stone he’d stopped to gather on the way. She glanced behind her, too aware of the growing distance between her and Jem. Tom and Jack walked alongside the wagon, Tom checking the ropes that held the load in place. Everything they owned or, rather, everything Tom and Jack owned, for she had nothing but her secret cache of five sovereigns and a filthy patchwork quilt to call her own, was on that wagon. 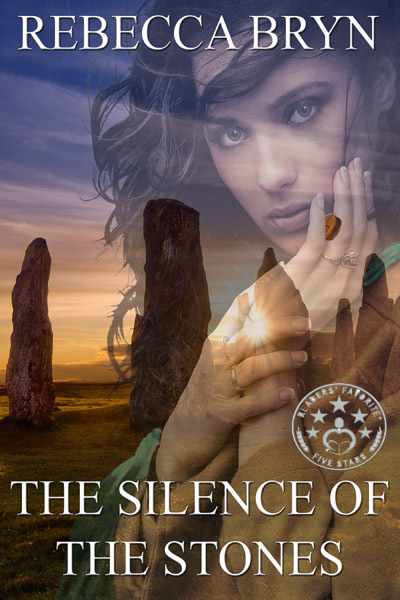 The Silence of the Stones: A mystery thriller set in West Wales – missing children, wrongful imprisonment, and revenge. 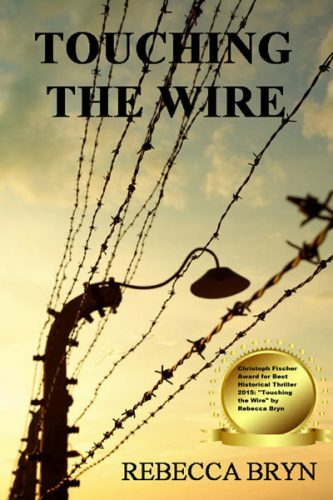 Touching the Wire: The women and children of Auschwitz and a man who tried to save them from a fate worse than death. 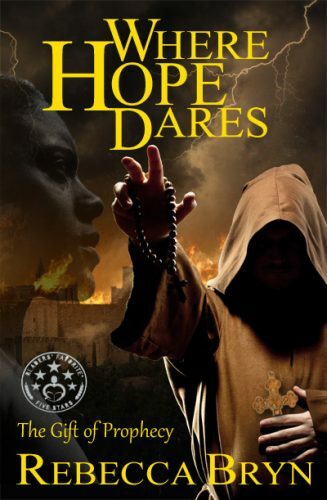 Where Hope Dares: a dystopian tale set in the High Atlas Mountains of Morocco. A 1000-mile journey to rescue the woman he loves. Kidnap, religious upheaval, and slaughter. A new order rises, and the old order fights back. There was always a next hill, and then another, and another. The distance they’d trudged today was barely more than the carrier ride from Yardley Hastings to Northampton, back home in England, but they could only travel at the pace of the old mare, and the trail, though broad enough for two carts to pass, was rougher than the newly metalled roads of Northamptonshire and uphill all the way. They’d been on the road for days and seemed no nearer to leaving the mountains behind or even reaching their crest. Jack’s decision to leave his ship in Port Jackson and come with them on Tom’s misguided search for gold the far side of the Blue Mountains had been fortuitous. Most of the people they’d met on the trail had been pleasant enough, but on occasion she’d been glad she and William had the protection of two strong men, armed with pistols and rifles. As Jack had pointed out on more than one occasion, Australia was rife with criminals. She smiled despite her exhaustion. Tom had been transported for sheep stealing, and she for theft. Her smile faded. “Two men are better proof against bushrangers and other murdering thieves.” That had been Jack’s warning when he’d bought the firearms in Sydney. Their new friend had lost no time in latching on to a couple who seemed to have money to burn and were setting out to prospect for gold the far side of the mountains on nothing more than the rumour of wealth to be had. She knew even less about Jack than she did about Tom, and that was little enough. Was Jakson Moore here as a free man or a convict who’d gained a pardon? If a convict, what had been his crime? Blue’s breath wreathed in front of her for a brief moment before the wind claimed it and whisked it away. ‘Come on, Blue. Walk on.’ The mare stepped forward, leaning into her collar, and she patted the animal’s neck. ‘Good girl.’ Without Blue, they had no chance of making it over the mountains with their possessions. The horse responded to her words of encouragement, and the cart rumbled on with Tom walking at her side and talking to William. They’d followed the ridge from Jamison’s Valley and the magnificent Wentworth Falls, the trail leading north now between wooded, rock-faced ravines that fell away to the east and west. They’d climbed ever higher across a scrubby plateau and, the higher they’d climbed the colder it had become. Winter’s fingers crept with merciless haste across the mountaintops, and the wind that blew across the ridge was icy cold. The land that had broadened into a plateau narrowed again, leaving them exposed on a narrow spine of land covered in black, scrubby brush above valleys that dropped away to meet other valleys and watercourses; the land spread out below them like wrinkled cloth or a Savoy cabbage leaf that held tiny lakes of water within its crinkled folds. The thought of cabbages took her back to the kitchen garden at Newhay Farm, and Harry, and the baby son she’d been forced to leave behind. Matthew would be a year old by midsummer. She pulled her hat down around her ears. A balmy midsummer in middle England, not the bitter cold of an Australian mountain midwinter. She forced a smile at William. He’d probably never know his half-brother back in England, but he would know the child that grew in her belly: Tom’s child and another tie to a man she might not be able to stay with. Tolkien – I love the way he invents a whole world to the finest detail and makes you believe it’s real. Read my books? Seriously, if any of you do read my books, please leave me a review. It’s what connects me to you, what helps improve my writing. It’s desperately important to an author to know what readers like or don’t like about their work. ‘The only thing written in stone is your epitaph.’ Because nothing stays the same, and we have the option to change things if we can find the courage. Click Here for my official website. Thank you so much for giving me this author spotlight, Melanie. It looks great.